When the UK Government abandoned its proposal to introduce minimum unit pricing for alcohol in July 2013, it argued there was a lack of concrete evidence that the policy would reduce the harm caused by alcohol without penalising responsible drinkers. In research published today in the Lancet, the Sheffield Alcohol Research Group show minimum unit pricing avoids penalising moderate drinkers on low incomes and would contribute to the reduction of health inequalities. Minimum unit pricing (MUP) sets a threshold below which a unit of alcohol cannot be sold to consumers. Under a 45p MUP a pint of beer containing two units would need to cost at least 90p and a bottle of wine containing 9 units at least £4.05. Since heavier drinkers typically pay less per unit for their alcohol than moderate drinkers, and of course buy more units in the first place, this means that heavier drinkers would be affected the most by MUP. In our new research, we explore the impact of MUP on those with low incomes who may be more likely to buy cheap alcohol. In particular we were interested in claims the policy could be particularly regressive by targeting drinks bought by the poor. To investigate this, we constructed a model of the relationship between MUP, people’s alcohol spending and consumption and the health risks associated with that consumption. 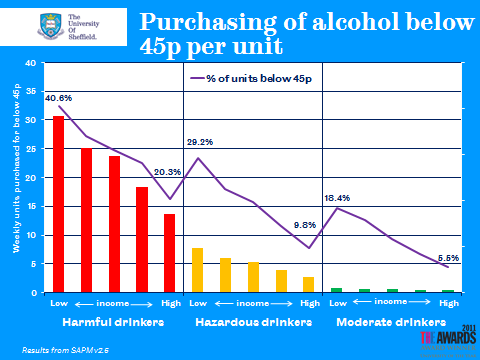 We separated the population into moderate, hazardous and harmful drinkers and found moderate drinkers in the lowest income group bought very little alcohol for less than 45p per unit – less than one unit per week on average. When we estimated how much their consumption would reduce under a 45p MUP, we found it would drop by just 4 units per year – approximately 2 pints of beer. As this income group were the least likely to drink and most likely drink at moderate levels if they did so, this suggests the overwhelming majority of those on low incomes would not be substantially affected by MUP. Among heavier drinkers the picture was different. For harmful drinkers, a 45p MUP was estimated to have a large effect which varied substantially by income. For the lowest income group consumption would fall by 300 units per year among the 5% who are harmful drinkers, compared to 34 units in the highest income group of whom 8% are harmful drinkers. Even though harmful drinkers with lower incomes are the group likely to be affected most by MUP, this does not necessarily mean the policy is regressive. To understand its full implications we need to look at its success in achieving MUP’s primary aim – reducing alcohol-related harm. For reasons which are unclear, those with lower incomes appear to suffer greater risks of harm from their drinking than those with higher incomes. The combined effect of the bigger risks and bigger consumption reductions means low income groups would be by far the biggest beneficiaries of the policy in terms of health improvements. A 45p MUP is estimated to lead to 860 fewer deaths and 29,900 fewer hospital admissions due to alcohol per year and routine or manual worker households would account for over 80% of these. On this measure, the policy can be argued to be strongly progressive. Model-based estimates of policy effects are, of course, subject to uncertainty and we take account of this by using different assumptions and inputting alternative data to see what the range of plausible effects might be. Although the size of the effects varied under these scenarios, the key findings remained the same and give us greater confidence in our conclusions. We consistently find, across a wide range of plausible scenarios, no support for the UK Government’s concerns that minimum unit pricing would penalise responsible drinkers. This is because the estimated effects on this group are negligible, even in the lowest income groups. Instead, the policy targets those at greatest risk of harm – heavier drinkers on low incomes. As such, the benefits of the policy are also concentrated on this group. The reduction of health inequalities, including those generated by alcohol consumption, is an explicit aim of the Government’s public health policy. Our research shows minimum unit pricing would make an effective contribution to reducing such inequalities by particularly reducing the harm caused by alcohol in lower socioeconomic groups. It also challenges perceptions about levels of drinking among the poorest in our society and raises important questions about how we judge the fairness of public health policies. Quite possibly because of confounding factors like poorer diet and poorer living conditions- they’re more likely to be less healthy to start with, and by the time they become problem drinkers, are much more likely to divert spending from food and heating to purchase alcohol.